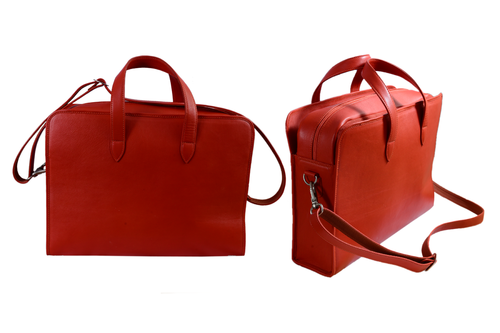 Leather Laptop Bags offered come designed and developed using superior grade tanned leather finish that provides in them superior construction value as well as meet the demands of shiny rich aesthetic finish looks. Further, its lasting durability and professional design finish also make these highly desired and demanded by the customers. Some of its features include provide for excellent usage performance; available in flawless construction finish and sturdy designs; provide for comfortable usage experience; match up with the tastes of customers. Established in the year 1994, "Elite International, Mumbai" is backed by rich industry experience of more than 19 years in offering an exclusive range of Executive Leather Bags, Leather Business Organizers and other Leather Goods. The range available with us encompasses Leather Desktop Set, Leather Folders, Leather Briefcase and Portfolios and Leather Accessories. Based at Mumbai, we are supported by state-of-the-art manufacturing unit, which is equipped with all requisite facilities including sophisticated machines. Our experienced personnel understand the varied requirements of the customers and offer the required product as per their specific needs. Further, we can also meet the bulk requirements of our clients and deliver the consignments within the given time. This has helped us to garner prestigious clients like World Health Organization, World Economic Forum, Barclays and BNP Paribas to name a few. Thus, we have been successful in catering to the requirements of our clients based across Europe, India, and China.